▶ The venue of the conference is Vivanta Dwarka , New Delhi. It’s 3 km from the New Delhi airport ( 10 minutes by taxi) . It is suggest to all to stay at the conference venue as it’s most convenient and also one gets the full experience of the conference. The rates are very attractive in any case. ▶Below the full conference package rate which includes stay (on Single or double occupancy) for 5 Nights and 6 Days with Breakfast & taxes. We have waived off the forum fee for those who are staying at the forum Venue. ▶ Transport price from International airport to conference venue Hotel Vivanta Dwarka by the hotel is INR 1100 +18% Taxes for Small Car. INR 1500+18% Taxes for SUV. delegates can also use an Uber or Ola service which would be one third cost of above. For attending WEF , You need to apply only for a tourist visa online for a “visa on arrival” as ours is not a traditional business forum. Please apply for the online e-visa at the following link https://indianvisaonline.gov.in/visa/tvoa.html The embassy will give you a registration number which you will give to the immigration desk at New Delhi airport and they will stamp your passport for entry. 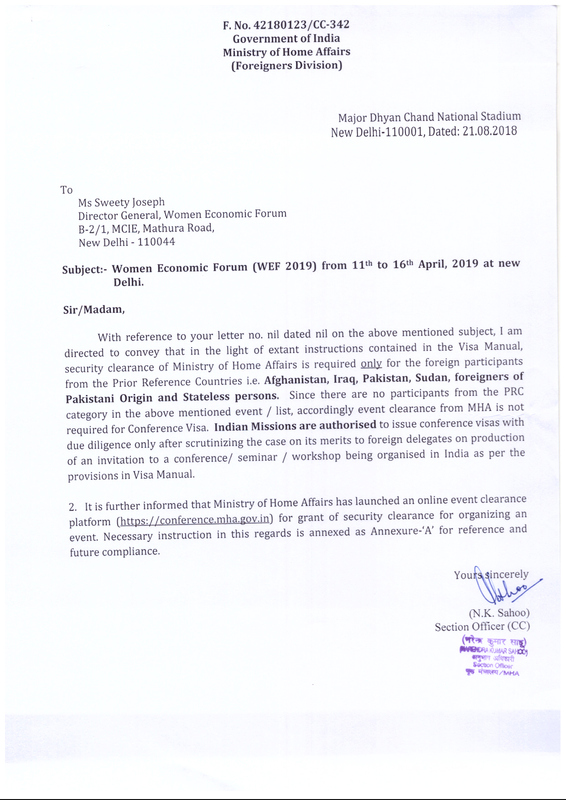 For contact please give name of: Ms. Nikita Agarwal Director Women Economic Forum (WEF), BII/66 MCIE, Mathura Road, New Delhi 110044. Email: nikita.agarwal@aall.in mobile: +919599481994. You can give your Contact Address while in India same as above or the forum venue Vivanta Dwarka Hotel New Delhi.